The breviary gives hymns, prayers and readings, along with instructions, for the prayer services called the 'divine office' which were said several times each day, and provided the material appropriate to feasts and saints' days. This page has prayers, readings, and hymns for the feast days of martyrs. 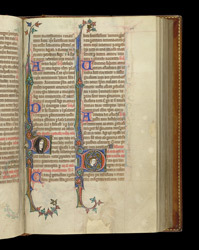 The historiated initial portrays a saint wearing a cowl. Next to it, a king beside an office for the translation (moving the relics to a shrine) of a royal saint.